In this post, I will create simple mail helper class for sending emails in ASP.NET MVC using C#. If you don’t have authentication for sending emails you can pass the emtpy string in MailAuthUser and MailAuthPass. To read CSV file doesn’t mean to use String.Split(). CSV files may contain commas, carriage returns, speechmarks…etc within strings. 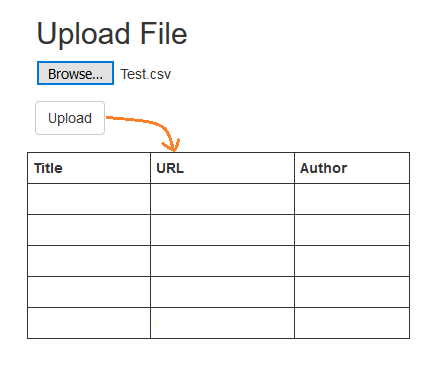 In this post, we will learn how to upload and read CSV File in ASP.NET MVC WITHOUT using Jet/ACE OLEDB provider. It is helpful when you have to deploy your code on shared hosting, Azure website or any server where ACE Database engine is not available. In this post, we will use a fast CSV Reader. We will read CSV file, get data in DataTable and show DataTable in View. ASP.NET MVC 6 Hosting - HostForLIFE.eu :: How to Connect an MVC Project to an SQL database? Right click on "Models" folder, choose "Add New Item"
Open your "Server Explorer" pane (if you cant see it attempt "View" on the menu bar and "Server Explorer"
Right click on "Data Connections" and choose "Add Connection"
Expand your newly added database to look at the tables. Drag the tables you wish over to the main pane of the "Link to SQL Classes" item you added at the start. Hey presto, you have a database context you'll run Linq queries against. Please bear in mind you will need to use the "Models" namespace to reference you database context objects. And now back to highly sophisticated programming! In this tutorial, we will discuss about how you can increase the performance of website using ASP.NET MVC. HTTP methods are not often thought about once writing ASP.NET webforms applications. Links are GETs, buttons are POSTs and it all happens automatically. With Asp.NET MVC, and other MVC frameworks like Rails, the http method used is more obvious and developers are begining to care about which they use. The problem is that GET requests tell visitors to your site, together with search engines, client-side web optimizers and other automatic tools, that it's safe to make the request. Which is a problem if your checkout button causes a GET. To quote Dave Thomas, paraphrasing Tim Berners-Lee, "Use GET requests to retrieve info from the server, and use POST requests to request a change of state on the server". The code for the Action Filter inherits from ActionFilterAttribute and overrides the OnActionExecuting event. By adding the AllowedHttpMethods attribute to all of my controller actions I can assure that http methods are used correctly. But then I found that I could achieve a similar result additional simply using UrlHelper, accessible via the URL property of the view. So I no longer see a need for my GenerateUrl method and have removed it from my helper. All of this would be much easier if there was some documentation. Im sure there is a better way so if you can think of an improvement please leave it in the comments.